Now that you’ve seen bits and pieces of what we do in stations in our class, (hint: a station can basically be any activity that you would normally do in class), all that’s left is how to organize it! Since you won’t be leading each group, it’s important that you have something posted for your students so they know what the purpose of the station is. I have laminated signs for “reading, writing, playing, ect. but I also like to add a little piece that includes an “I can…” goal! For example, my listening station this week was watching a youtube video with the Spanish alphabet and their goal for the station was “I can spell my name in Spanish.” This was totally new, but they almost all could accomplish the task afterwards. I also try to sum up the student directions into 3 easy steps. If it takes more than that, they are going to need your help. I also usually give them 1 paper that has 2 quick questions about each station and what they learned on it. It helps them remember the new infomation they have discovered and it’s proof that they learned something. Next order of business, How will you set up your stations? I like having them as distinct areas of the room. I think it helps students focus on the task more like this. I have a big room so I can do this pretty easily. Here’s how my room is set up. Each station has the materials that might be needed right at their fingertips. I leave them there – so setting up the stations is a breeze! Finally, How often? How long at each station? How long until they are ready to “practice”? There is no wrong way to eat a reece’s, I mean, run stations. You have to decide what works best for you. I have 70 min classes, 10 ipads, and 31 students in each class. For me, I usually do one of these options. Stations 2x a week (Tuesday and Thursday) for the whole class period. Monday we start something new and then they are ready to dig in on Tuesday. I don’t send them to stations after they learn something, I send them to learn something! They need no prior knowledge to complete these tasks. Their job is to learn something new – figure it out with their group and bring it back to the class on Wednesday. We start together and then I give a 1 minute run down to the whole class of what they will do in each station (even though the directions are posted there) and then I set them free! They have 10-11 minutes in each station. This also allows for a mini-break when they change stations and a few minutes to wrap things up at the end. My other favorite is to introduce something new Monday and then teach mini-lessons the first half of class Tuesday, Wednesday, and Thursday. The second half of class those days is for stations. I plan 6 stations a week and they do 2 a day. 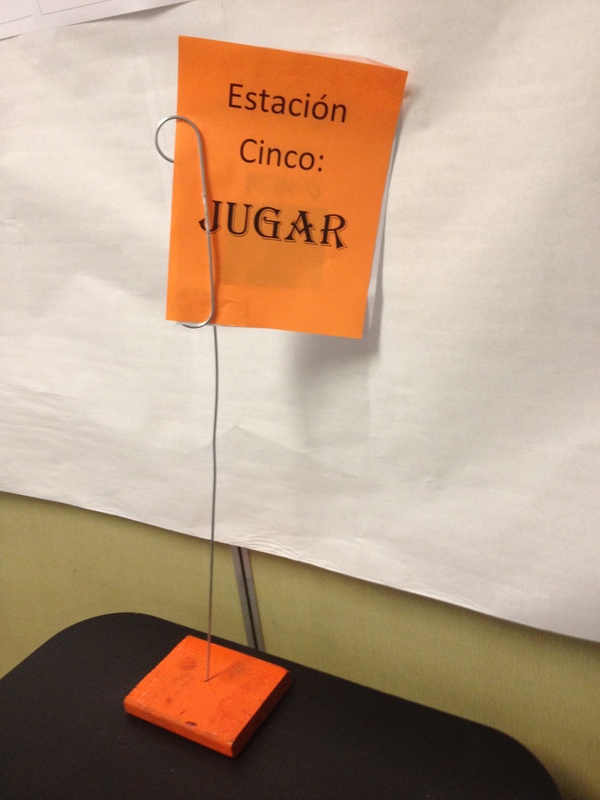 This is nice for Spanish one, since many of the objectives don’t take a long time to teach (i.e. I can tell where I’m from). Friday ends up being a day to put what they’ve learned together (OUTPUT). We might record videos or create something hands-on. 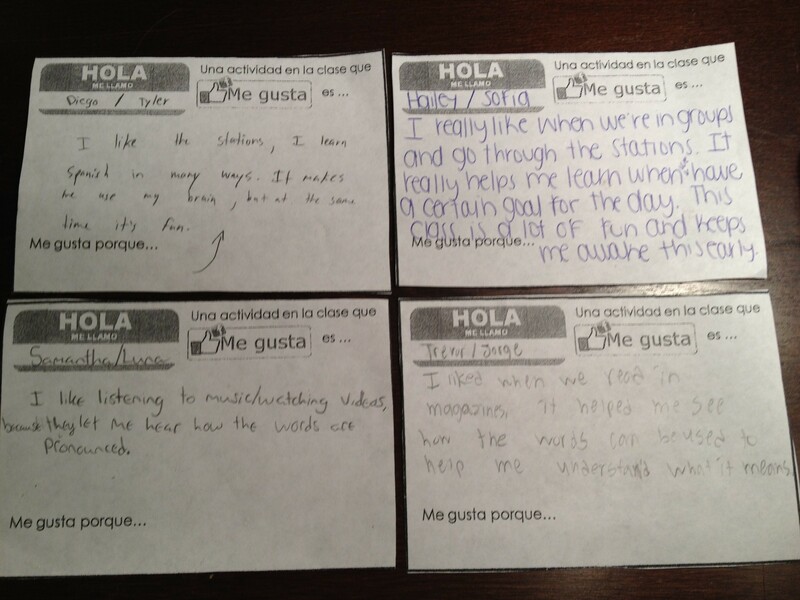 We’ve been in school about 3 weeks and I asked students what has helped them learn the most in class so far. While each kid liked a different activity, almost everyone mentioned something that we did in stations. I like how Diego said “It makes me use my brain” – Don’t all of his classes?!? Hopefully that answers any questions you might have. If you missed anything important you would like to know, leave a comment below! Please share your success if you use any ideas from any of the posts! We’d love to hear about it! Want to read more about stations?? Hi- I am loving this blog. I have already picked up so many great ideas from you. I have a question about the days in which you do only 2 stations a day. Do you have multiple locations for the 2 different stations? I am trying to figure out how you do this with a class of 31. My classes range from a very small one of 11 to a large one of 28. They are all technical Spanish 1. Also, for your little classes, I would just let them move freely. When thy are ready for something new, they get up and move! All 6 different stations are going at the same time, but students only get to 2 a day. 5-6 kids per station, rotate 10-15 minutes. Also, i forgot to write this in the post but I definitely recommend displaying a timer with your overhead so kids can manage their time. I love your blog, also! Do you have unlimited paper suppy? I love the different forms you have for the activities, but does each child get a form for each different activity (including your daily warm-ups and videos?) It is so much better, but I have a limited number of copies that I can make (even if I buy my own paper). I tried some computer work yesterday and felt like they wasted time. My solution to cut down on paper and expenses- I have my students print their own documents and forms such as Syllabus, listening guides, stamp sheets, etc…). I only print for those students who are not able to do so. I also do this for the committee that I chair. I have members print mtg. agendas and other documents themselves. In both cases, I do bring 1-2 copies b/c students (and even adults) forget them. However, as in the Kara pointed out about students who lose their stamp/”I Can” sheets – they normally only do it one time ;). Hope this helps you cut down your paper supply. I love this post and one point you made really hit home. You put students in stations to learn something, not review. I have never used stations to learn something new – I am going to attempt this on Friday! Thanks for the inspiration! So they do kind of travel in a “pack” from station to station, as groups not as indiiduals? I think it works best for big classes if they move in a pack, but small classes may be different. If your students are motivated, I would let them more where they want, WHEN they want. I taught a summer class with just a few kids and I let them move on their own. I set the timer and they get to work. They never had to wait for anyone else – just pure learning! So they do kind of travel in a “pack” from station to station, as groups not as individuals? Just wanted to say your blog is awesome. I’m a 7th year teacher, but this is my first year teaching Spanish. I have already used several hands on activities and games from your website. Today I did stations…I learned that I had waaaay too many for a 45 minute class period. Advice to other teachers out there with 45 min classes–start with 2 stations, keep the kids seated. Half way through class have them switch activities. With my next 4 classes today, half of the kids will be creating flashcards and the other half will be working on puzzles. Then, half way through, switch! I think this will work out much better. Thanks again for sharing your knowledge with everyone! You are making a difference! Thanks 🙂 I love the community that we have here! So many good ideas coming from everyone’s classes! Do either of you believe that stations are useful for reviewing material, or more effective when learning new material? I thing stations can work either way, but I believe students are more motivated when they are learning and seeing something new. We want to inspire students to learn and experience the language, not just complete a task. All of us have behavior issues from time to time, and I think these kids act out because they are bored. Our stations definitely include and build on what we have learned but also have some sort of new twist. I’m no pro when it comes to stations, this is just my 2 cents! Reading – Read how Susi’s family members are feeling and circle the answers to the comprehension questions. 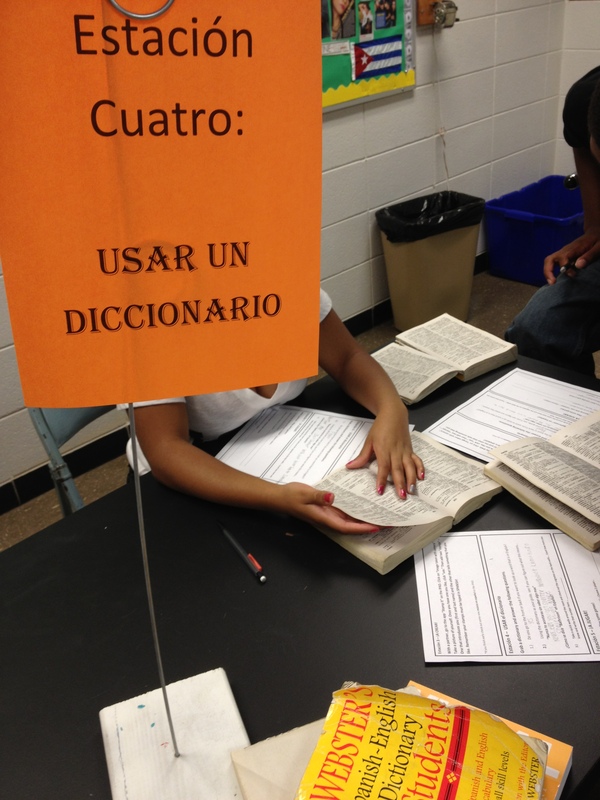 Hi, for higher levels such as Spanish 3 would you have them do more than 2 stations twice a week? I love this idea!! I did try it and I liked it because they were taking ownership of their learning. I had them give me a written feedback the next day on their thoughts on the stations. The majority liked it because it was different and not boring, but most said they needed more time on some of the activities. I have been teaching Spanish for 20 years, but I always come to this blog for new ideas. Teaching Spanish has changed SOOOOO much since I started in 1993, so sometimes I still feel like a new teacher. I decided to try the stations the other day, and it was a huge failure. I now know what some of my problems were. First, we did it at the end of a unit, so the motivation to learn something was VERY low. Next time I will try it at the beginning of a unit. Also I teach two different preps (Spanish II and Spanish III pre-AP) and I was only trying to do this with the Spanish II classes. That meant arranging and rearranging my room twice a day for two days. The second day I tried not to rearrange,and that just simply didn’t work. They just flat out didn’t get with their groups if it meant moving the desks themselves, or I had two groups all working together (don’t ask how if they should all have been doing a different task). Anyway, I was behind on my reading and I just read this post today (did the stations last week) and I will definitely try again with some modifications. Thanks for all the great ideas! Leer: reading magazines, picking out main idea of one article, but mostly just to expose to Spanish magazines. Mirar y escuchar: Watching Septiembre by Las Lavalamps and completing an activity from Zachary-Jones.com. Jugar: they are playing a card game using vocab words. Hablar: creating a sock puppets conversation on my personal ipad and my teacher ipad. Filmar: using 2 flip cameras to film a presentational assessment. Aprender: using dictionaries and a worksheet I have that demostrates the difference between meanings of words that are very similar or have accents vs. don’t. I’m expecting it to be a little crazy, and also to last 3 periods. We’ll see what happens! This is in place of a “test” so the kids are super excited. Yeah! Hope it went well – no… actually, Hope it was messy and fun! That is when my students learn the most! My favorite thing you wrote was how students were using both of YOUR ipads to learn! That is the kind of tech use that helps students grow! Thanks for sharing! I finally organized stations for my upper level classes as they reviewed the future tense and it was a success! Thank you for your ideas! 1. What do you do with the students that race through the activity so that they can answer the questions on their “accountability” sheets? 2. I would like to set up stations again in the near future as my students learn/use vocabulary associated with “Sports”… any ideas or things that you have done that are a must? I’m so glad you did them! For students that raced through: I would look at the task you asked them to do. How did you have them “reviewing future tense?” First, we both suggest that stations are for students to LEARN from. If they already know how to do it, why would they take the time to practice? Next I would see how they are USING the language. Is there a communicative task or only conjugations? Finally I suggest that they move on to another station when done. Did each student do an accountability sheet or was it a group effort? Is there another way you can hold them accountable? Like an assessment at the end of class? Then the focus is on learning/preparing instead of filling out a paper. Did you tell them they had to do the sheets for a grade? If so, you took the focus off of learning and put it on completion. Stations and any class work has to be focused on learning. This has been a big shift in my teaching in the last year. Please take what I suggested as something to reflect on, not as a critique. I’ve had many people “push me” along the way! As for ideas, search “sports” on our site. Any posts that pull up could be used as a station. 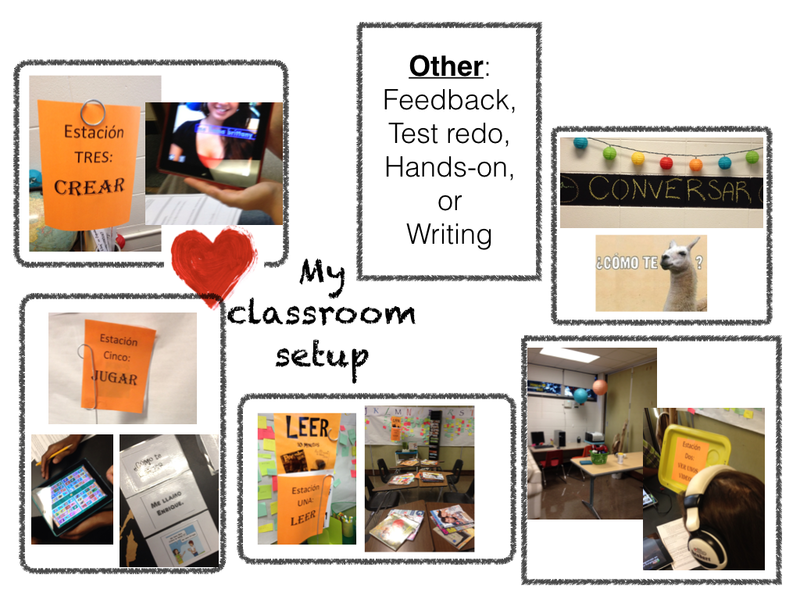 I suggest to take a goal (I can…) and create stations that cover all the modes and skills (reading, writing, etc). Like the other veteran teacher I am revamping y classroom as I find that the students today are very different from years ago when i began teaching. Does anyone have any ideas on a center for telling time? I am planning 8 centers to use in full classes for next year so I have time to create the needed materials. I absolutely love your blog! Question: Since students collaborate and work together in each station, how would you prevent excessive talking or off-task behavior? Also, would you have “quiet” stations in which students have to work individually? Thank you! Thanks Gabriela! I’ve found that keeping the activities short and having an assessment are crucial. Of course there are times that they are off-task, but no more than other tasks. It is also crucial that you are walking around. I take note of stations that they are most off-task. Usually that means that I need to rework it. Maybe it was too easy/hard or didn’t have much learning value or they didn’t like it. I also let students “free roam” through the stations (not timed). So if they are talking, I encourage them to move to the next one. You can try a quiet station. I have reading stations, but I still let them help each other out. Since they are in groups, I try to make the activities as communicative as possible because it is natural to talk if people are there.